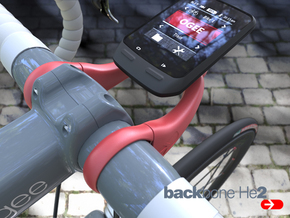 Put yourGarmin Edge 20, 25, 200, 500, 510, 520, 800, 810, 820, 1000 and 1030 centered and in your line of sight with the BackBone. Use it as a hi or low forward position or over the stem. Light and stiff the BackBone weighs in at 15 grams (the OEM forward mount is 27 grams), and is at home on your mountain, road or commuter bike. A “below deck” clip for mounting lights and cameras will be available in the near future. BackBone fits all 31.8 mm diameter handlebars and is carbon bar safe. You will need to purchase separately, two M4 x 12mm or longer socket head screws and nuts. Although not required, two o-rings can be installed for added security. 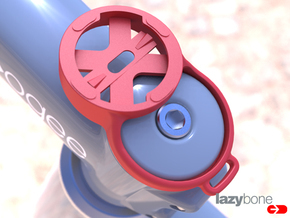 Look for 5/8” inside diameter, 1/16” thickness (AS568-016) for increased friction between mount and handlebar. O-rings are typically found in the plumbing aisle of your local hardware store or online. Once you receive the HipBone printed part it is important to inspect all attachment features on the part. You may want to use a toothpick to clear out any residual “build material” (which will look like dust) that might have made it past the Shapeways technicians. Because of the precision and small size of the attachment features, it is necessary that all surfaces be clear of unwanted material for proper function of the part. Important: Before you insert the nuts into the part, you may need to clear out any loose or packed-in build material from the cavity that captures the nut. This can be done with a toothpick. 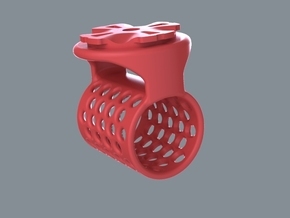 Once inserted into the capture feature the nut should align with the screw hole on either side. If the nut and screw holes are not aligned you can remove the nut and inspect the feature for any loose debris that might be interfering with proper alignment. 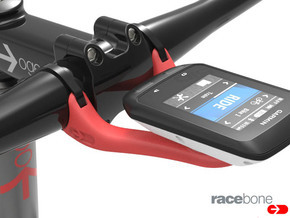 Also inspect the eighth turn mount feature (where the Garmin locks on) for any residual build material. Typically this is not a problem, but there may be unwanted material packed-in around the locating features (protrusions left and right), accessible from opposite the mounting side. Mounting Torque: Tighten the mounting screws just enough to secure the mount to the handle bar, do not over tighten. The force required to lock the mount in place is very small. Although the “strong and flexible” nylon material is extremely tough, it can fail if over stressed in the mounting process.